This is an old project that I’ve been meaning to blog about for some time and, over a year later, am finally finding the time to write up. The project is a USB controlled (and powered) bank of relays assembled from cheap boards that can be purchased from ebay. The total cost a controller board and a bank of eight relays is about £6.50 (or $10 USD if you prefer to count like that). 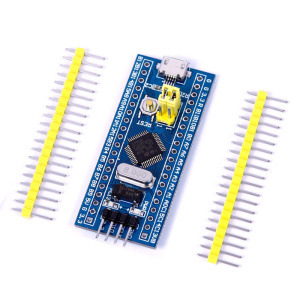 The controller board is an STM32F103C8T6 breakout board which provides the USB hardware and an ARM Cortex M3 CPU combined with enough FLASH and on-board RAM to make writing software fairly easy. These terrific little boards can be found on eBay for a whisker over £3 and are just perfect for hacking together all kinds of USB toys and tools (some of which may be the subject to further blog posts). The only other components needed is the relay board and a bunch of jumper wires. 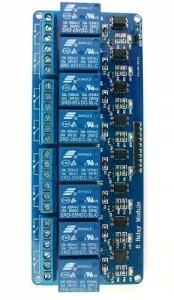 Relay boards can be bought on eBay in single, dual, quad or octo configurations depending the complexity of your projects. 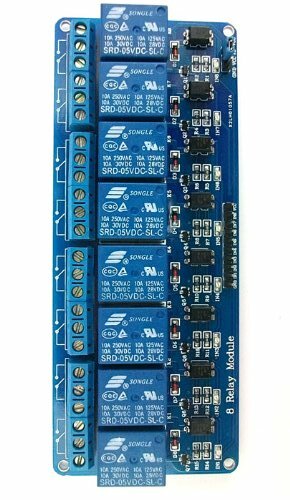 I use this project to automate things on my rather modest pool of development boards but definitely need all eight relays (and then some). My relays control power delivery and, for some boards, they are also used to automate changes to jumper configuration. The HiSilicon HiKey board (from 96Boards.org) is especially needy in this department. To automatically test its debrick/recovery process requires three relays. One for power control and a further two to manipulate the jumper configuration. The completed system is fully USB powered with the relay board taking a 5V feed from the controller. Eight relays can be pretty hungry when they are all energised at once but we do just about manage to sneak in below the 500mA USB current limit. So… the hardware in this build is very simple and can be assembled even by someone with no electronics knowledge. What about the software? There is a complete firmware for the device which can be FLASHed to the controller board without much fuss. The firmware contains a simple command interpreter which is present to the host as a CDC/ADM class compliant device. This allows the device to operate without drivers on more or less any operating system. The firmware has a couple of extra bits of polish to make it more practical. In particular the unique serial number embedded into all STM32 devices during manufacturing is extracted and persented as the USB serial number. This allows udev to be configured to recognise specific devices and give them stable device names regardless of any rearrangements of the USB bus topology. This allows a single host PC to (reliably) support a very large number of relays. Also included in the firmware package is a tiny shell scripted called targetctl which allows individual relays to be named, even across multiple usb-relay devices. The firmware consists of a bootloader and the main image. The bootloader can be downloaded either using the UART bootloader included in the ROM of almost all STM32 devices. However I prefer to hook up an ST-Link (these are also easily found on eBay) to the controller boards JTAG pins to FLASH to bootloader. Once the bootloader is in place its easy to install the main image using a DFU programmer such as dfu-util. After the main image has been installed the device reboot and enumerate as a CDC/ACM device and is ready to use. With the main image installed the board will launch into it automatically. However pressing the reset button will force the device back into DFU mode ready for a firmware update. 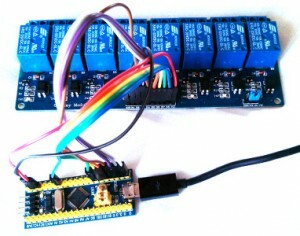 For more information on how to install the firmware see http://github.com/daniel-thompson/usb-relay.git . Finally to finish up I would really like to thank all the folks who work on libopencm3. The USB code in usb-relay comes from libopencm3 and without it then usb-relay probably wouldn’t exist in its current form.